Ten people in the disputed territory of Kashmir have been killed in ongoing gunfights between militants and Indian troops, an Indian defense spokesman said Sunday. “So far we have lost an army officer and three troopers, while six militants have been gunned down by the army in past three days,” Indian defense spokesman, Lt. Col. J.S. Brar told CNN on Sunday. The fighting started after troops were tipped off about the presence of heavily armed militants in the region. 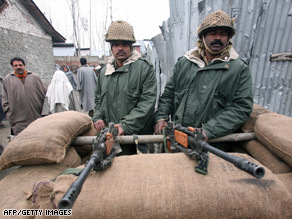 Security forces encircled a forested region to close in on the militants. Militants opened fire at the troops and both sides traded fire. “The operations are being conducted in a densely forested and highly foliaged mountain range,” Brar said. The gun battle is the second-longest of the year in Kashmir after the nearly seven-day-long encounter in the mountainous Poonch district of Jammu region in Indian-administered Kashmir in January. The onset of summer and melting of snows in mountain passes often leads to increased influx of militants from across the Line of Control, police said. The Line of Control is the border in Kashmir between the Indian- and Pakistani-controlled region of the disputed province. The other day, India said, Pakistani troops had opened indiscriminate and unprovoked fire at its positions in northern Kashmir along the Line of Control. One trooper was injured. Kashmir has endured a violent separatist campaign for nearly 20 years, and authorities say 43,000 people have been killed. However, various non-governmental organizations and rights groups put the number of dead at twice the official count.